Last spring, Ryan Tarrant applied for a job with the new Hyatt Place nearing completion in downtown St. Petersburg. Why is St Petersburg Becoming America’s Hottest City? This once sleepy, coastal city is becoming one of the America's most popular places to live in and its downtown renaissance is a major reason why. Which Local Favorites Were the Big Winners in the Annual "Best of St. Pete" Awards? The vibrant city of St. Petersburg is the midst of a downtown renaissance which was celebrated recently with the announcement of this year’s list of “Best of” attractions, business, beaches and parks. St. Petersburg's vibrant and eclectic downtown atmosphere has been drawing new residents to the city's center and local businesses have been vying for their attention. How Does an Art Lover Spend the Day in St. Petersburg? Forget that out-of-date misconception that downtown St. Petersburg is just a sandy beach town and the city goes dark just after the sun goes down. The Firestone Grand Prix of St. Petersburg comes to town this week. In its 13th year, this year’s Grand Prix will include 13 races with the week. Why Everyone is Buzzing About the New St. Petersburg Pier? St.Just outside the pier district, rises ONE St. Petersburg's luxury tower residences and premier hotel, making it the new center of attention in this vibrant cityscape. St. Petersburg has rolled out the Coast Bike Share Program with 100 demo bikes spread across 10 hubs along the city's waterfront and Central Avenue corridor. ST. PETERSBURG (FOX 13) - Construction has barely started on a St. Petersburg high-rise – and the retail space is already sold out. Which St. Petersburg Area Beach is the Best of the Best? St. Petersburg is home to some of the world’s most pristine sugary white sand beaches, clear gulf waters, and plenty of warm sunshine. Discover today! What Makes Sundial the Destination of Choice for St. Petersburg Dining and Shopping Afficiandos? At the epicenter of contemporary fashion and culinary delights, St. Petersburg claims some of the most engaging shopping and dining in the world. A large waterfront plaza has emerged as the centerpiece of the 25-acre Pier project planned for downtown, acting as a gathering spot that would serve as the city's "living room." Move over, Epcot. The annual St. Pete Wine & Food Festival returns next week with a fresh lineup of gourmet tasting experiences over five days. Kolter Urban’s visualization of the modern-day, carefree lifestyle is on perfect display with the spectacular Discover floorplan at ONE St. Petersburg. With construction well underway, ONE St. Petersburg has launched the exclusive Club ONE Concierge program. Owners at ONE St. Petersburg are able to take full advantage of this one-of-a-kind amenity service while the project is still in development. The second annual SPF brings dozens of wide-ranging arts events, covering a spectrum of creations and experiences, showcasing a diverse array of local and national artists, organizations, and St. Petersburg style. The Saturday Morning Market boasts local farmers with fresh produce, great food, interesting crafts and lively music but proclaims that the spirit of the community is the what truly defines the market's experience. All across the Florida’s Gulf Coast, retail and residential development has made a dramatic comeback. Previous sleepy streets and empty lots have become vibrant downtown centers full of life. But nowhere is this trend more evident than in St. Petersburg. Expanding to nearly 5,000 square feet, with 4,062 sf of air-conditioned living space and four over-sized terraces with stunning views, never before experienced. ONE St. Petersburg, a 41-story luxurious mixed-use high rise, will not only be the tallest building on the St. Petersburg skyline, but will tower above the historic Skyway Bridge by more than 20 feet. One St Petersburg extends special pre-construction buyer incentives till August 30th. To learn more visit the Sales Gallery at 330 Beach Drive NE, St. Petersburg. The Real Deal is reporting that a New York company has a contract to pay more than $15 million for an entire block of downtown St. Petersburg. St. Petersburg has become known for mixing residences with commercial space and entertainment venues — a goal many cities have tried to achieve but have failed to fully execute. 10News political reporter Mark Rivera catches up with former Mayor Rick Baker to talk about the changing landscape in St. Petersburg. Bay News 9 covers the groundbreaking of ONE St. Petersburg and the positive growth this provides to the city. Sales of pre-construction condos at One St. Petersburg have already topped $110 million, making the project the top-selling condo right now in the Bay area. True to its word, Kolter Group is beginning construction on ONE St. Petersburg early. Tampa Bay's economic progress can be measured by its companies, its job growth and GDP, its population, its corporate headquarters, its entrepreneurs, its graduation rates, its universities and its patents. Even its swagger. ST. PETERSBURG (FOX 13) - Construction of what will become Pinellas County's tallest building is now underway, three months ahead of schedule. When Kolter Group started planning One St. Petersburg, a 41-story condominium tower on Second Street North, its executives knew the deal could be pushing the limits of a market the size of St. Pete. There is no denying downtown St. Petersburg is undergoing revitalization. There are new shops, new restaurants, new hotels, and soon lots more new homes for those wanting to live in the center of it all. St Petersburg luxury condos generate high interest. Over 100 people have made a reservation to live in one of the 253 available luxury condos. High number of reservations for the luxury residences of One St. Petersburg show the robust demand for luxury condos near the downtown waterfront near the Tampa area. In another sign of downtown St. Petersburg's soaring popularity, a 174-room Hyatt hotel will be part of a $200 million retail-condo project a few blocks from the waterfront. St. Petersburg Mayor Rick Kriseman Wednesday formally asked the Federal Aviation Administration to change flight rules at Albert Whitted Airport to allow 450 feet tall buildings downtown. Right now, the limit is 400 feet. If the stature of the forthcoming One St. Petersburg condo tower is a measure of the demand for luxury living downtown, the biggest phase in this city's residential boom is still yet to come. Tonight Smith & Associates Real Estate and the Kolter team had a fantastic Grand Opening party for ONE St. Petersburg. One thing we got to see at the party was the newly released commercial for ONE as well as a fantastic virtual tour of this brand new construction condo project due to be completed Fall 2018! St. Petersburg -- The new One St. Petersburg tower will not only be the tallest building in the city, its height might change the flight paths of aircraft. The developer hoping to build a 41-story tower in St. Petersburg wants the Federal Aviation Administration to raise the maximum allowable height for buildings in the city. One Progress Plaza holds the title as the city's highest at 386 feet, 5 feet taller than Signature Place, and a little under the Federal Aviation Administration's height limit of 400 feet. Already known for its vibrant urban waterfront and thriving cultural scene, downtown St. Pete saw some landmark deals in 2014 — all of which play off of each other to create a live-work-play neighborhood. Downtown St. Petersburg is a growing hot spot and soon there will be another development to add to the list. ONE St.Petersburg will be a 41 story, 253 unit condo tower complemented by a garage and retail base along with a second tower featuring 174 hotel rooms. The Kolter Group has now submitted to the City of St. Petersburg site plans for development of the so-called "Trop Block" near the downtown waterfront. The tallest building in downtown, One Progress Plaza at 200 Central Ave., is 389 feet tall, but a new building will rival that height. Downtown's residential development boom is in full swing. Three apartment buildings are completed, four more are in various stages of construction and six condo projects are under way. A South Florida developer's plans for a new luxury tower in downtown St. Petersburg are ambitious and market data suggests the time is ripe for such a project. A West Palm Beach developer has revealed plans for perhaps the most prime piece of undeveloped real estate in the city's downtown. The Kolter Group LLC has announced development plans for the downtown St. Petersburg block bordered by Central and First Avenue North and First and Second streets. A long-empty parcel in the center of downtown recently bought by prominent businessman Bill Edwards will get new life as a hotel and condominium complex. St. Petersburg, Florida – A local developer on Wednesday announced plans to build a mixed-use property in downtown. In April, Bill Edwards bought the Tropicana block for $12 million, sparking speculation about what the mogul planned for the rare block of nearly vacant land in the heart of downtown with almost unlimited potential. A dynamic downtown, a dazzling waterfront, an electric mix of nightlife, dinning an culture. Only one new address puts you in the center of it all. One St. Petersburg. A new era in contemporary downtown living. 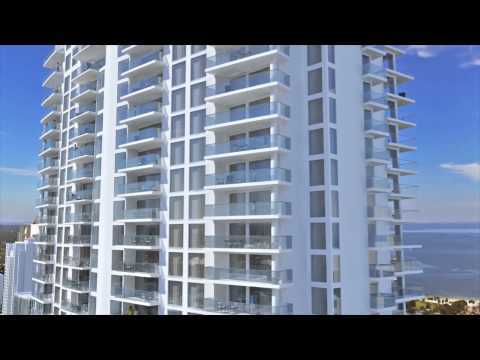 ONE St. Petersburg is a luxury condominium in downtown St. Petersburg with condos starting from the high $600s. For information call 727-240-3840.